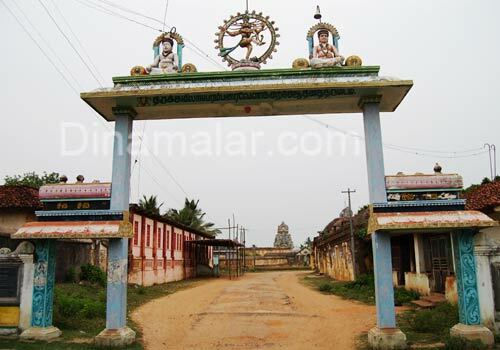 This sivasthalam temple is located 7 Kms from Nannilam. Another paadal petra sthalam Tiruppugalur Varthamaneecharam is located inside the Agneewarar temple at Tiruppugalur near Konapiran shrine. 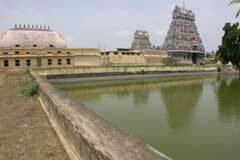 ADivya Desam shrine of Lord Vishnu is situated at Tirukkannapuram which is very near to Tiruppugalur. Lord Shiva is Swayambumurthi in the temple. Saint Tirunavukkarasar, also known as Appar attained salvation in this place. Muruga Nayanar, one among the 63 celebrated Saivite Nayanars was born here. Agni Bagwan graces in the temple with 7 Jyoti lines, five hands and three legs, an idol too rare. 10 day Vaikasi Poornima Brahmmotsavam in May-June with an event of Lord granting darshan to Agni Bhagwan,; 10 day Appar Baktha Utsav in Chithirai beginning on Sadaya Star day in April-May; small festivals each month and on pradosha days of the month, Deepavali in October- November; Pongal-Makara Sankranthi falling almost on January 14 and Tamil and English New year days are the festivals celebrated in the temple. Vasthu purity is an important basis for constructing buildings. This is a science that deals with the designing of the apartments in a particular direction Kitchen, bathrooms, main hall, bedrooms etc at appropriate sides. This would avoid any invisible troubles entering then. This is a temple noted for Vasthu prayer. Before beginning the construction, people use to bring the bricks to the temple, perform archanas and take them back for the building work. Pregnant women worship Ambica for safe delivery. According to the Sthala Purana, Ambica Herself as a midwife took care of a woman in labour pain and ensured safety to both mother and child. A prasad oil is offered in the temple for the purpose. Devotees worship Lord Agneeswarar for mental peace. They are blessed with boons of wedding, child, job opportunity, progress in trade, promotions and welfare. Devotees offer Kalyana Malai-wedding garland and vastras to Lord and Ambica for the wedding boon. They also perform abishek with milk, cosmetic powders, turmeric, sacred ash, oil, milk etc. and dress Ambica with sandal paste. Devotees distribute the nivedhana to other devotees and contribute for temple renovation fund. The temple is opened from 5.30 a.m. to 12.00 a.m. and 4.00 p.m. to 9.00 p.m.
Sri Agneeswaraswami Temple, Thirupugalur- 609 704, Nagapattinam District. Contact Number - +91 4366 237 198, 273 176, 94431 13025, 94435 88339. Lord of the temple is praised by Saint Tirugnana Sambandar in his Thevaram hymns. 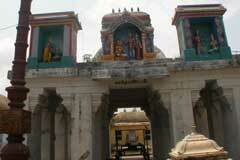 This is the 75th Lord Shiva temple on the southern bank of Cauvery praised in Thevaram hymns. This is the sacred land where Saint Tirunavukkarasar respectfully known as Appar Adigal attained salvation after serving the Lord by cleaning Shiva temple grounds and paths to enable devotees to walk comfortably with an instrument in his hands called Uzhavaram. This land is praised as Salvation Centre. Appar festival begins 10 days before Chithirai Sadayam Star dayin April-May. The events includes his home coming from the Jains, the greatness of his Uzhavaram, dance of Deva women and his merging with Lord at the midnight of the fourth day festival. Every devotee would be moved to see this episode only with tears in his/her eyes. There are two shrines in the same temple for Saint Appar Adigal and Saint Sundarar. Lord Agnipureeswar (Swayambumurthi), also praised as Sharanyapureeswarar, Pratyaksha Varadar and Konapiran is gracing devotees from a shrine. Mother Karundhar Kuzhali, also praised as Sulikambal blesses devotees from other shrine. Lord Vardamaneswarar and Mother Manonmani are in a separate shrine. Muruga Nayanar served Lord Vardamaneswara by preparing garlands for Him. This is also the place where Agni Bhagwan worshipped Lord Shiva and got relieved from a curse. Though he has no form as such, he appears here with two faces, 7 hands, 7 jwala sparks, four horns and 3 feet. This is a rare Agni Bhagwan idol. Lord changed the bricks into gold bars for Saint Sundarar in this holy place. Those building new houses bring bricks to the temples for vasthu and bhoomi puja to make the new building all prosperous. Also, Mother Karundhar Kuzhali was gifted with a piece of land for her services to a woman in labour pain and is praised as Sulikambal. There is no and will not be any infant or maternal mortality in this place, a belief people strongly hold. The temple has a single shrine for Emperor Nala and Sani Bhagwan in the temple. After Nala came out of a bath from the Bana Theertha, a voice from Sani Bhagwan said that He would leave the king from his adverse aspects at Tirunallar 7 km far from this place. Saturn-Sani Bhagwan is this temple is praised as Anugraha Sani merciful Sani. The grace of Mother Karundhar Kuzhali towards Her devotees is boundless. Sool in Tamil means pregnancy. As She took care of a woman during her labour time and ensured safe delivery of the child, She is praised as Sulikambal. Women strongly believe that nothing untoward would happen to them or the child as they under the direct grace of Mother Sulikambal. People pray to Her offering vastras for child boon. Three Murthis in the temple, Bhoodeshwarar, Varthamaneswarar and Bhavishyeswarar are the symbols of past, present and future. This is the birth place of Muruga Nayanar who worshipped Varthamaneswarar offering garlands made by him. He has three faces human, bird and a swine. As devas sought asylum here for protection from the threats of demons, the place is also praised as Pugazhoor. Banasura belongs to the demon community. His mother was Madhiniar. She was a staunch Lord Shiva devotee. To facilitate his mothers Shiva puja, Banasura was bringing many swayambu Lingas. He once came to Tirupugalur and found countless Lingas. He found a Swayambulinga but could not move it. He dug a deep and vast Agazhi around the temple and tried to move the Linga again but in vain, except that the agazhi was full of water springing from the ground. He decided to end himself in frustration. A voice from the sky told Banasura, "I will make myself present for your mother?s Shiva puja?. Lord in the name of Konapiran with Punnai flowers on His head, appeared before his mother. After the puja was over, Lord returned to Tirupugalur.Lord Shiva is a swayambulinga. Agni Bhagwan in the temple has 2 faces, 7 hands, 7 jwala sparks, 4 horns and 3 feet. 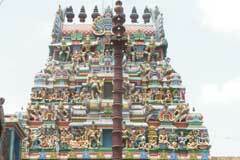 Vedapureeswarar Temple, Tiruvottriyur, Chennai, Ta..
Kodunkundreesar Temple, Piranmalai, Sivaganga, Ta..